Vancouveria hexandra is closely related to Epimedium species and grows well in similar woodland conditions. Is also known as the ‘American Barrenwort’ and ‘Inside-out-flower’. An excellent companion for Dicentra spectabilis. 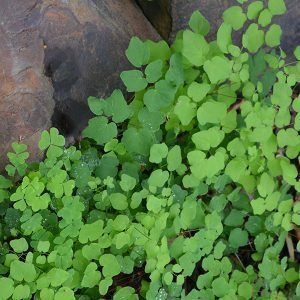 Native to the Pacific North West, from Oregon through to California, this is a woodland plant with attractive foliage and interesting flowers in spring. Vancouveria hexandra will reach a height of around 35 – 45 cm, and will form a nice clump which can be divided in early spring if clumps become to large, or to help establish a larger colony. A clump forming perennial with white flowers with reflexed petals (hence the name ‘inside out flower’) are held above the foliage in spring to summer. Vancouveria hexandra spreads by underground rhizomes, however it is easy to control. Fertilise with a liquid seaweed fertilizer in spring. Height – To 25 cm in height, often less. Spread – Will slowly spread by underground rhizomes to form a clump. Position – Good dappled shade. Foliage – Dainty small ferny foliage, mid green in colour. Flowers – White rising above the foliage on purple stems.